SOME ANIMAL GROUPS HAVE NAMES YOU'VE HEARD. LIKE A SCHOOL OF FISH OR A FLOCK OF BIRDS. Some group names are naturals--a band of gorillas, all hanging out together and making music, or a cry of hounds, howling on the chase. Some are more inventive. For example, who are these guys? WITH SUCH POOR EYESIGHT, THEY REALLY SHOULDN'T DRIVE! 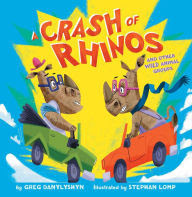 It's a crash of bespectacled rhinos in a tangle of fender-bending collisions on the savannah throughway, of course. And what group of animals might be termed a tower? Giraffes, of course! They're a one-critter watchtower! There are teams of hogs, scrimmaging in the mud, a run of salmon, streaming upstream, and a committee of vultures, all hunched over their clipboards. And, of course, a parade of elephants, orderly marching trunk to tail, is a natural. The fun of animal group names is what Greg Danylshyn's A Crash of Rhinos: and other wild animal groups (Little Simon, 2016) is all about. Artist Stephen Lamp's digital comical illustrations and apt book design (a vertical two-page spread is reserved for the giraffes, of course) make the animal's group names both memorable and humorous. Pair this one with Betsy Rosenthall's An Ambush of Tigers: A Wild Gathering of Collective Nouns (Millbrook Picture Books) for a double dose of collective creature nouns (see review here).